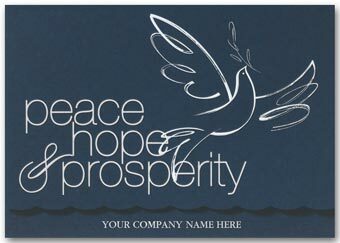 Adding an enduring and beloved symbol of the holidays, the Doves of Peace card offers your customers a lovely seasonal sentiment.Unique touches include silver foil with white pearl foil accents.Add your company's personalization to the high-quality paper stock. 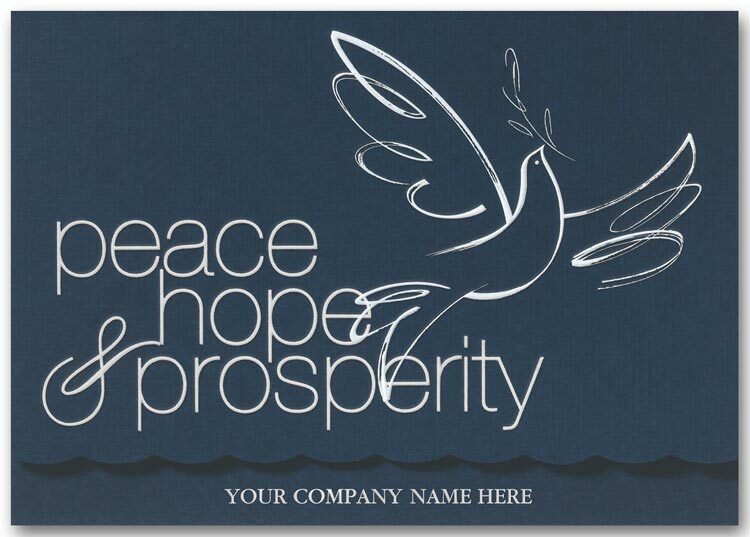 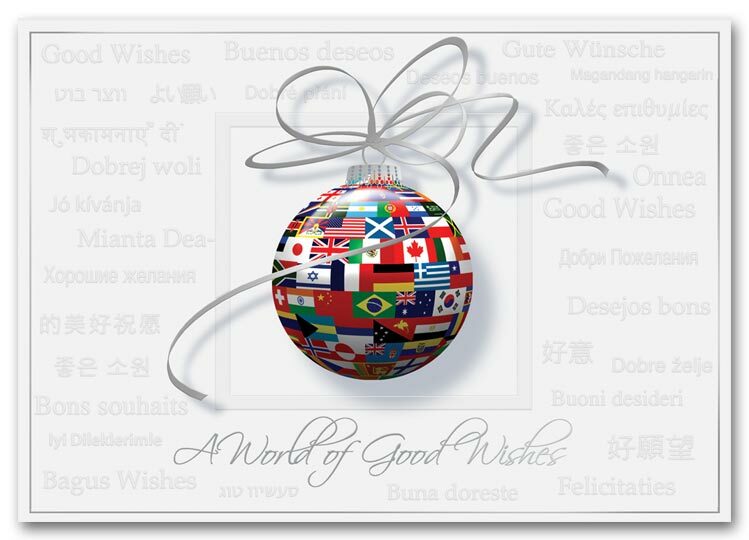 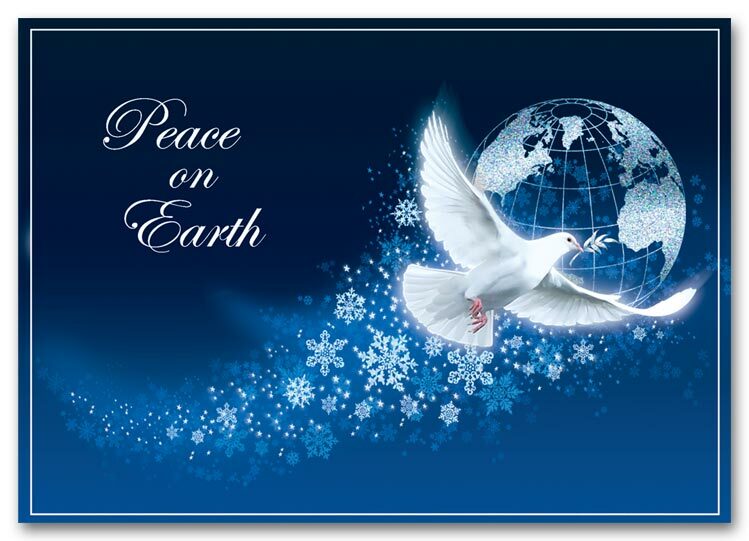 Share your greatest holiday wish with every customer in the World Peace card.Unique touches include a silver foil border, accents and greeting.Add your company's personalization to the high-quality paper stock. 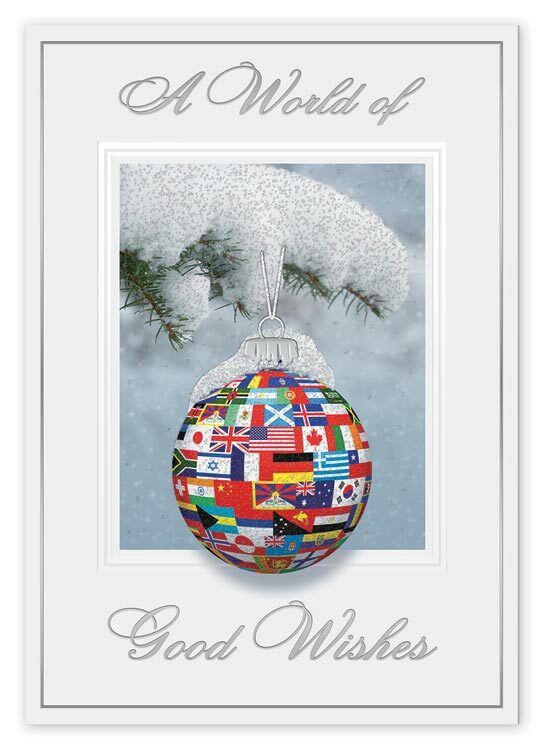 A stellar example of great holiday greetings, the Star-Bangled Ball card features eye-catching details.Unique touches include a prismatic embossed ornament.Add your company's personalization to the high-quality paper stock. Beautifully designed, the Wings of Ribbon Card delivers high-quality greetings from your company with a personalized message.Unique touches include shiny silver foil, green metallic foil leaves.Add your company's personalization to the high-quality white paper stock. 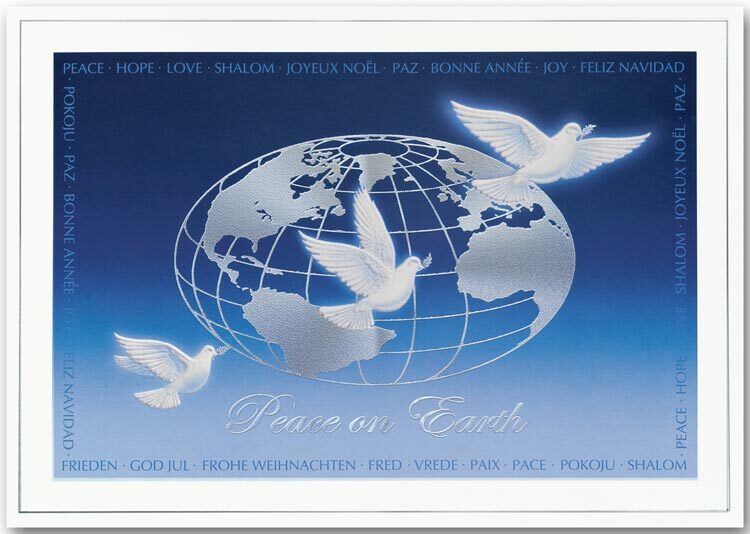 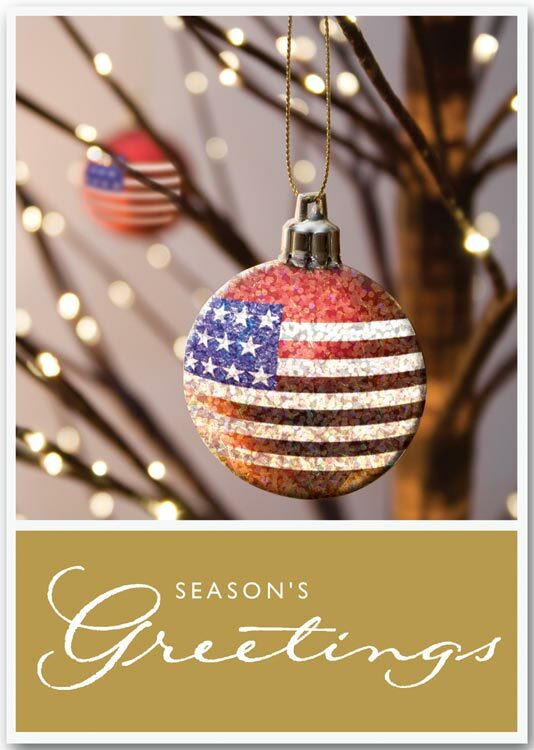 Beautifully designed, the United in Joy Card delivers high-quality greetings from your company with a personalized message and logo imprint inside.Unique touches include silver foil cap, greeting and border, embossed border, ornament and snow.Add your company's personalization to the high-quality white paper stock. 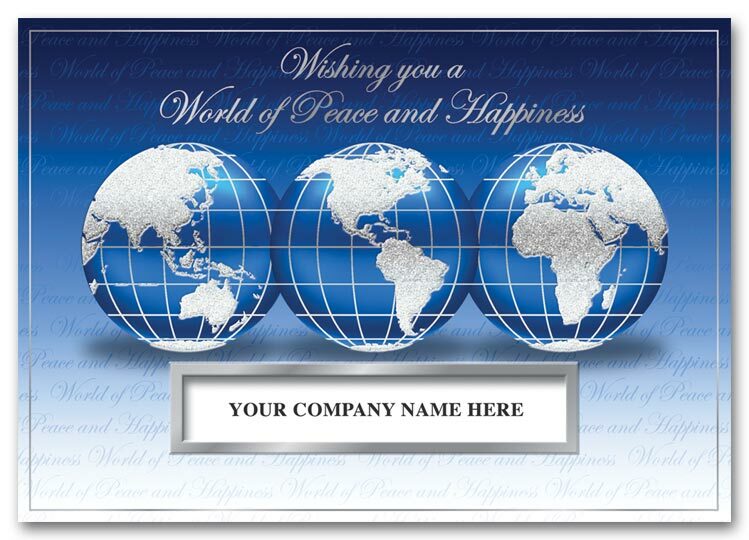 With the right mix of elegance & affordability, this custom printed card conveys your best wishes to your most valued customers! 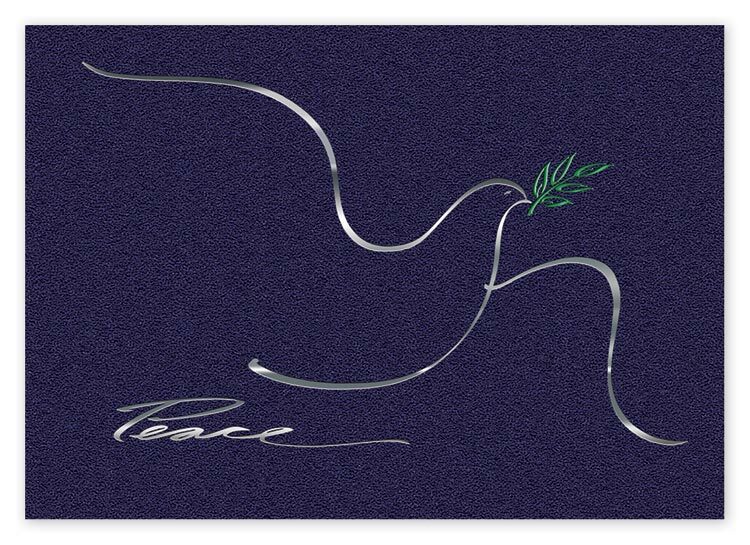 This card is an outstanding value, sure to create a lasting impression!These cards are created on high quality superior paper stock with metallic foils, holiday imagery and custom foil imprints.Serene silver dove on blue linen stock with die-cut edge. With the right mix of elegance & affordability, this custom printed card conveys your best wishes to your most valued customers! This card is an outstanding value, sure to create a lasting impression!These cards are created on high quality superior paper stock with metallic foils, deeply embossed holiday imagery and custom foil imprints.Embossed silver foil ribbon and colorful ornament on white matte stock. 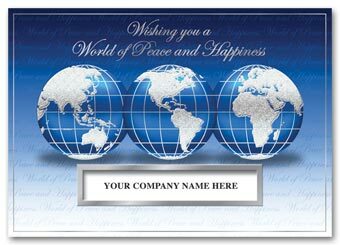 With the right mix of elegance & affordability, this custom printed card conveys your best wishes to your most valued customers! 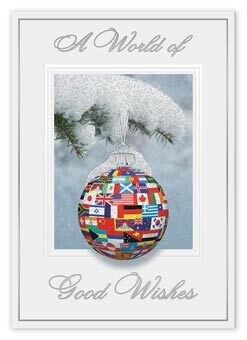 This card is an outstanding value, sure to create a lasting impression!These cards are created on high quality superior paper stock with metallic foils, deeply embossed holiday imagery and custom foil imprints.Embossed silver continents with die-cut window for imprint. 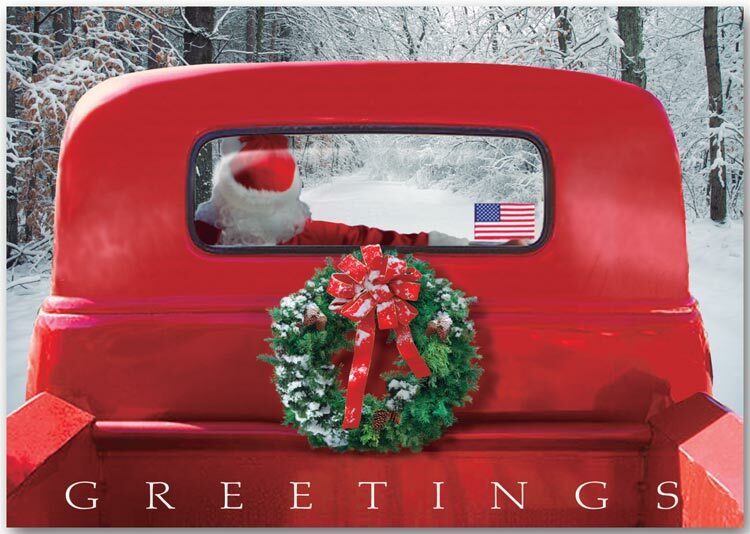 Affordable and adorable: our 4-Wheeled Sleigh card.Unique touches include detailed artwork celebrating the season.Add your company's personalization to the high-quality paper stock. 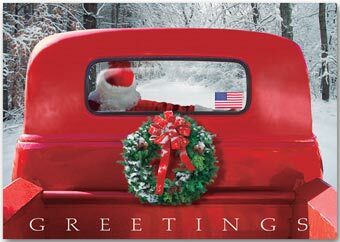 Send warm holiday greetings with this simply elegant, budget friendly card!These cards feature personalization with your company's messages, quality paper stock and rich, full-color imagery.Symbol of peace shares its worldly message on white gloss stock.